The effectiveness of the Order of the Virtuous Blood at vampire hunting is questionable. Initially, the head of the order is himself a vampire. The order will happily invite characters who are vampires to join their order. They claim to be seeking out vampires, but apparently have never found the rampant vampire activity under the city (i.e., in the sewers under the Arena district). They haven't found out about Jakben either. They freely admit that they are too weak to actually fight vampires themselves. Their only means of combating vampirism appears to be the 250 gold reward they will provide to honorary members of the order. Players can take advantage of this, assuming they have completed the Mages Guild quest, by using the Enchanted Chest. 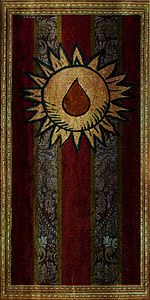 If you complete the Order of the Virtuous Blood and kill Seridur, Roland Jenseric will offer you membership. The main benefit of membership is that you are able to give Roland vampire dust in exchange for 250 gold (see Vampire Dust for details on which vampire dust qualifies). A minor benefit is that items in Seridur's basement can be taken, but the items are mostly small value. The most valuable item is a copy of Immortal Blood, a Hand to Hand Skill Book. No other quests are associated with the Order. This page was last modified on 19 November 2018, at 03:40.